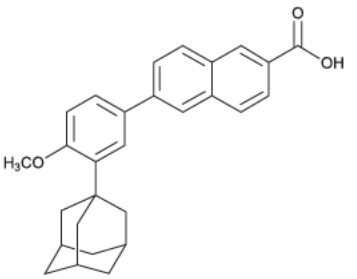 Adapalene gel 0.1%, containing adapalene USP, is used for the topical treatment of acne vulgaris. Each gram of adapalene gel 0.1% contains adapalene USP 0.1% (1 mg) in a vehicle consisting of carbomer homopolymer, edetate disodium, methylparaben, poloxamer 182, propylene glycol, purified water and sodium hydroxide. Adapalene gel, 0.1% is indicated for the topical treatment of acne vulgaris. Adapalene should not be administered to individuals who are hypersensitive to adapalene or any of the components in the vehicle gel. Pregnancy Category C. No teratogenic effects were seen in rats at oral doses of adapalene 0.15 to 5.0 mg/kg/day, up to 120 times the maximal daily human topical dose. Cutaneous route teratology studies conducted in rats and rabbits at doses of 0.6, 2.0, and 6.0 mg/kg/day, up to 150 times the maximal daily human topical dose exhibited no fetotoxicity and only minimal increases in supernumerary ribs in rats. There are no adequate and well-controlled studies in pregnant women. Adapalene should be used during pregnancy only if the potential benefit justifies the potential risk to the fetus. Adapalene gel 0.1% should be applied once a day to affected areas after washing in the evening before retiring. A thin film of the gel should be applied, avoiding eyes, lips, and mucous membranes.